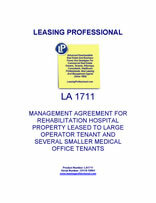 This form is a property management agreement for a rehabilitation hospital complex. The parties to the agreement are the owner of the hospital and a healthcare property management firm. A major portion of the space has already been leased to the operator of the rehab hospital, but the property contains additional medical office space to be leased out during the agreement to medical office tenants. The compensation payable to the property manager is in the form of a general oversight fee pegged to the rent paid under the operator's lease, plus leasing commissions payable with regard to new leases signed during the term of the property management agreement.